Hm. For the second time this summer, a brand new, locally-made spin on living dead cinema will shuffle forth from within one of the area’s vintage theatres. I’m not exactly sure what inspired such a coincidence – although it must be a sign that lo-fi mummies have finally been handed their pink slips – but I’m crossing my fingers that this upcoming effort will hold to its makers’ promise and reanimate the proverbial dead horse that is the zombie horror film. ZOMBIE MOVIE will have its World Premiere this Friday, July 20, 7:30 p.m., at the Lincoln Square Theatre, 141 N. Main St., in downtown Decatur, IL, paired up with director Brandon Clayton‘s prior short film, SIX DEGREES OF STARDOM OR HOW RONALD REAGAN REMEMBERS THE LIFE OF BRANDON CLAYTON. Admission will be free and refreshments available for purchase, including alcohol for the 21+ crowd – yet another welcome parallel to the recent Bloomington showing of LATE AFTERNOON OF THE LIVING DEAD (see item: 6/8/07). Clayton filmed ZOMBIE MOVIE in his Illinois hometown of Taylorville earlier this spring using the combined talents affiliated with his company, Hazard Films, and kindred spirits 747 Productions (see item: 1/26/07). 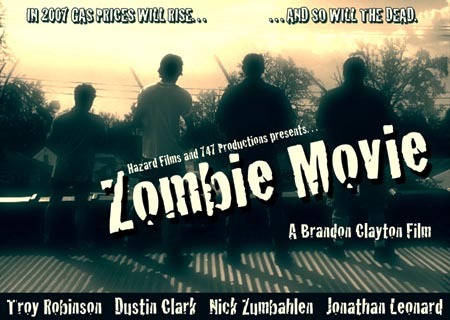 The short examines what happens when Yet Another Zombie Outbreak forces four blue-collar workers to quarantine themselves after being “bitten” – metaphor-implying quotes courtesy of the film’s MySpace page – and await the terrifying outcome. This entry was posted on Wednesday, July 18th, 2007 at 9:18 pm	and is filed under Public Events. You can follow any responses to this entry through the RSS 2.0 feed. Both comments and pings are currently closed.